Cottbus, 04.02.2019. 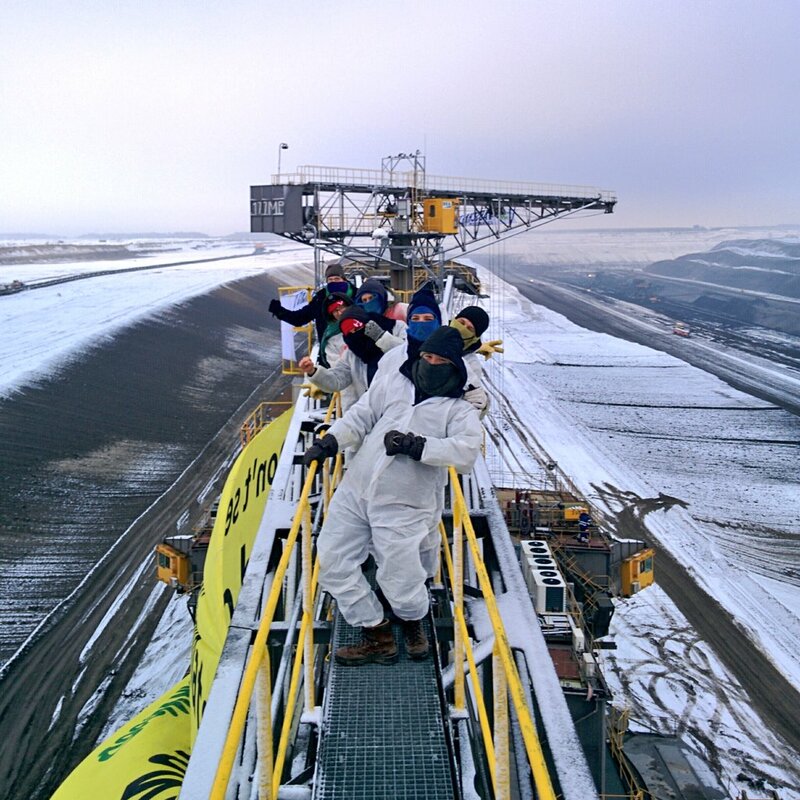 The excavators are at a standstill: activists from Ende Gelände have been occupying several excavators in the Lusatia coal-mining areas and in the Leipziger Land region since this morning. With civil disobedience they protest in the lignite mines against the final report of the coal commission and for an immediate coal exit. “The Coal Commission has abandoned the people in the threatened villages. The companies get money for nothing, there is no certainty for the villages. Every day the excavators continue to feed towards Proschim and Pödelwitz. We have occupied these excavators today because we cannot wait until 2038. We demand the immediate exit of coal so that all the villages remain: in the Leipziger Land and in the Lausitz as well as in Rhineland”, says Nike Mahlhaus, press spokeswoman of Ende Gelände. The coal commission’s proposal envisage phasing out coal until 2038. There is not yet an exact exit path for coal-fired power plants in eastern Germany. It is therefore not yet clear whether the villages threatened by dredging – Proschim in Lusatia and Pödelwitz and Obertitz near Leipzig – can be preserved. Instead, compensation payments are promised for energy companies such as LEAG and Mibrag, both of which belong to the Czech investment company EPH. “Coal combustion until 2038 is not a consensus, because we are rushing past the 1.5° limit with billions of tons of CO2. The CO2 produced here causes sea levels to rise in other places, leading to droughts and other extreme weather events. People in the Global South did not sit at the negotiating table, although they are most affected by the climate crisis. We oppose this injustice. In this way we also give a voice to those who are directly affected,” says activist Elisa Lange. The occupation is part of the action week of Ende Gelände for an immediate coal exit. Numerous actions have already taken place over the past week in response to the failure of the Coal Commission. Coal infrastructure has been blocked in Karlsruhe and Hamburg, and protests for climate justice have taken place in numerous cities. With mass civil disobedience actions and protests Ende Gelände and local action groups demand the immediate exit of coal and worldwide climate justice. Most recently, around 6,500 activists* had blocked the coal infrastructure at the Hambach opencast mine in Rhineland during a mass action in October 2018. Ende Gelände, February 4, 2019.